The year is two-thirds over! The next estimated tax payment for individuals is due September 15. Extended calendar year returns, except individuals, are due September 15. Estates of 2010 decedents should consider extension. September 17 is disclaimer deadline for 2010 estates. September 30 is a key date for inherited retirement accounts. Covenant not to compete amortized over 15 years. Life insurance lifetime proceeds used to pay cash value loan are taxable. IRS issues regulations for combination life and long-term health care contracts. "Creative" net operating loss carryover disallowed. Gift of S corporation stock followed by distribution resulted in taxable income. Subsequent adjustment of allocation of gift to charity allowed. Guidance issued about carryover basis for 2010 decedents, but still no form. Out of state LLCs with California managing member probably subject to California LLC tax. Financial Insider Weekly now broadcast in Morgan Hill. 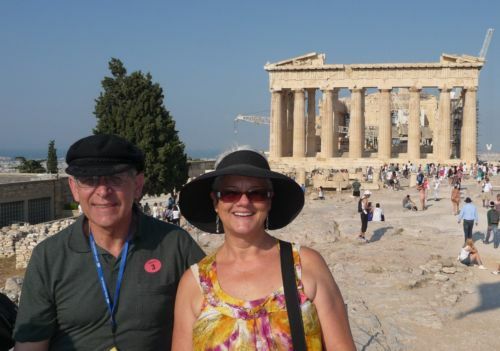 Here are Janet and I visiting the Parthenon during our Greek Isles cruise. Janet and I had a fabulous Princess cruise and anniversary celebration, starting from Venice, including visits to Venice, Dubrovnik in Croatia, Corfu, Mykonos, Olympia in Katakalon, Mykonos, Kusadasi (Ephesus) in Turkey, Athens in Greece, Rhodes, Santorini, Pompei/Naples/Sorrento, and ending in Rome. We were especially impressed with Turkey. Many of the events in the Acts of The Apostles took place in Turkey. We visited the ruins of Ephesus, formerly a port city of 250,000 that was abandoned after it was destroyed in an earthquake and the oceanfront moved a couple of miles away. Did you know that Mount Ararat is in northern Turkey and that Turkey shares the Tigris and Euphrates rivers with Iran and Iraq? We visited a site that is believed to be the retirement home of Mary, the mother of Jesus, and is a destination for pilgrims. Compared to many of the other destinations that we visited, Turkey had lush vegetation. If you are interested in visiting a second holy land, Turkey is a great destination. It happens every year. Before we know it, another year is coming to a close. Labor Day is past. September 23 is the first day of Autumn. Most of the children are back in school. Before we know it, Halloween, Thanksgiving and Christmas will be here. Itâ€™s time to start thinking about year-end tax planning. To make an appointment, call Dawn Siemer at 408-918-3162 on a Monday, Wednesday or Friday. My grandson, Panch Baker, and his mother, my daughter Holly Baker, are celebrating their birthdays during September. Many of you know Thi Nguyen, who worked with me for many years. Thi and her husband, Allen Le, had their first born son, Lance, last August. We are thrilled for them! Remember that California has "front loaded" the first two estimated tax payments and there is no September estimated tax payment for California. If you are paying your estimated tax payments based on your actual income and deductions for this year, be prepared to assemble your information for the September estimated tax computations. The extended due date for 2010 income tax returns of calendar year corporations, S corporations, partnerships, estates and trusts is September 15, 2011. Hope yours is already done! The extended due date for 2010 individual income tax returns is October 17, 2011. (October 15 falls on a Saturday.) We can still take two more new clients for preparing their 2010 individual income tax returns. To make an appointment, call Dawn Siemer on a Monday, Wednesday or Friday at 408-918-3162. The due date for federal estate tax returns of decedents who died from January 1 to December 17, 2010 is September 17, 2011. (See below for those who elect carryover basis, instead.) The IRS hasnâ€™t issued Form 706 for 2010 decedents yet! These estates should probably request a six-month extension of time to file, which would make Form 706 due March 17, 2012. The due date for decedents who died after December 17, 2010 is nine months after death. These estates are also eligible to file for extensions to time to file their federal estate tax returns. One of the most powerful estate planning tools after a death is the disclaimer. It simply means, "I wonâ€™t take it." For example, a surviving spouse can disclaim inherited property from the predeceased spouse and let his or her children receive the property instead. This is significant because property inherited from a spouse usually isnâ€™t subject to estate tax, but property inherited from a parent is. Using a disclaimer can help to use the maximum estate tax exemption, which was $5 million for 2010. Since the exemption for 2010 wasnâ€™t determined until December 17, 2010, Congress extended the time to make a qualified disclaimer for 2010 deaths until September 17, 2011. If you think you could benefit from such an election, see your attorney now. Sometimes beneficiary designations for retirement accounts, including Roths and IRAs, can result in the benefits having to be distributed over a short time, such as when a charity is a beneficiary in addition to other individuals. Also, some beneficiaries will have shorter life expectancies than others. These issues can be eliminated by paying out the share of the non-qualified beneficiaries and dividing the account into separate shares for the individual beneficiaries by September 30 of the year after the year of death of the account owner. The executor technically isnâ€™t responsible for administering most retirement accounts, so inherited accounts may not receive the attention they deserve and these actions are easily missed. If you think you may have been a beneficiary for a retirement account of an account owner who died during 2010 and could benefit from taking these actions, consult with a tax advisor now. We are now focusing on finishing extended income tax returns. Some of our readers have found errors in or are uncomfortable with tax returns that they prepared using tax software or were prepared by other tax return preparation companies. We can provide a second opinion. Others have received notices for tax audits and sometimes canâ€™t get the help they need from their tax return preparer. We can help with all of these. To make an appointment, call Dawn Siemer on a Monday, Wednesday or Friday at 408-918-3162 from 9 a.m. to 5 p.m.
An S corporation redeemed all of the stock of a 23% shareholder. Part of the agreement included a covenant not to compete for one year. The corporation tried to deduct the payment for the covenant not to compete over the term of the agreement. The First Circuit Court of Appeals upheld the Tax Court in finding the IRS was correct in disallowing a current deduction. Since the covenant not to compete was in connection with a stock acquisition, it is a Section 197 intangible asset, required to be amortized over 15 years. A taxpayer bought a life insurance policy payable at the death of the insured or when the insured reached age 65. A number of cash value loans were withdrawn from the policy. Then the policy benefit was paid as a lifetime benefit at age 65. Most of the proceeds were used to pay off the cash value loans. The Tax Court ruled in favor of the IRS, finding the total life insurance benefit less tax basis was taxable. In order for the life insurance proceeds to be excluded from taxable income, they have to be paid as a death benefit. Many taxpayers are surprised when they surrender their life insurance policies or sell them during their lifetime, only to learn they have a taxable transaction. Be sure to get tax advice about the structure of your life insurance arrangements. One of the provisions of the Pension Protection Act of 2006 provides that payments for long-term health care insurance as part of a life insurance policy arenâ€™t taxable income. The IRS has issued regulations with guidance about these "combination contracts." According to the regulations, amounts applied to long-term health care coverage are subtracted from the investment in the life insurance contract. The regulations also provide for tax-free exchanges of life insurance contracts and combination contracts. The Internal Revenue Code specifies the order of applying net operating losses. There are exceptions for certain years and carrybacks can be waived, but the general rule is losses are carried back two years and then carried forward up to 20 years after the loss was incurred. A married couple reported tax losses for 1988, 1989, 1990, 1991, 1996 and 2001. They reported taxable income in 1992, 1993, 1995, 1997, 1998, 2000 and 2003. They tried to simply apply all of their losses to 2003. The Court of Federal Claims ruled in favor of the IRS in disallowing this "creative" sequence of applying to losses because it didnâ€™t conform to the Internal Revenue Code. Moral: To get the tax benefits of net operating losses, you have to follow the rules. You wonâ€™t save time and money by shortcutting the process. An S corporation shareholder sold 95% of his shares to his son at a substantial discount, resulting in a taxable gift. Shortly after the sale, a distribution exceeding the tax basis (cost used to computed taxable gain or loss) was distributed to the shareholder. The Tax Court ruled in favor of the IRS, finding the shareholder had a taxable long-term capital gain for the excess of the distribution over the tax basis of the remaining shares. If the shareholder had taken the distribution before selling the stock to his son, he wouldnâ€™t have had a capital gain. Moral: It pays to give attention to the details relating to distributions by S corporations to shareholders, especially when planning transfers of stock. The IRS made a valuation adjustment for an LLC ownership interest on audit of a gift tax return. The person who made the gift was deceased. The executor made an adjustment, increasing the number of shares of the LLC transferred by the decedent to a charitable foundation. (Gifts to charitable foundations arenâ€™t subject to federal gift tax.) The gift and sale documents indicated that her intent was to transfer a specific value (equal to the gift tax exemption) of the shares to trusts for her children and the balance to the charitable foundation. The Ninth Circuit Court of Appeals ruled against the IRS, finding the shares the charitable foundation was entitled to receive were not contingent on a future event. The charitable foundation was entitled to the fair market value of the share of the LLC, not the value reported on the gift tax return. The court also found that formula clauses were not against public policy. As a result of this ruling, formula charitable clauses will become more popular in estate, gift and charitable planning. The IRS has issued guidance about the time and manner to elect carryover basis for the estates of decedents who died during 2010. These are a few very valuable estates that elect to treat the estate tax as repealed for 2010. According to the guidance, the election and allocation of carryover basis adjustments are to be done by Filing Form 8939 by November 15, 2011. The IRS hasnâ€™t issued the form yet! Previously the IRS said the form wouldnâ€™t be due until 90 days after the final form was released. Since these clients tend to be concentrated in a few law and CPA firms, there are some very grumpy practitioners in those firms. An issue is, if the deadline is further extended, the forms could be due during tax season. Not a happy situation. An out of state LLC with real estate located in another state is generally subject to Caliorniaâ€™s LLC tax if one or more managing members are California residents. If a nonmanaging member is "doing business" on behalf of the LLC, the LLC is also required to register and file an income tax return. Morgan Hill cable subscribers can now watch Financial Insider Weekly on MHAT, cable channel 19 on Mondays and Tuesdays at 4 p.m. and 7 p.m. Pacific Time. The program will be simultaneously broadcast on the internet as streaming video at www.mhat.tv. Tell your friends! September 16, Scott Haislet, attorney and CPA, "Irrevocable life insurance trusts"
September 23, Peggy Martin, CLU, ChFC, MSFS of The Family Wealth Consulting Group, "The role of life insurance in estate and financial planning"
September 30, Stanlley Zlotoff, attorney, "Bankruptcy for individuals"
October 7, John Olagues, Truth In Options, "Employee Stock Option Basics"
October 14, John Olagues, Truth In Options, "Employee Stock Option Hedging Strategies"
October 21, Mark Erickson, attorney, "Divorce â€“ California Style: Basics"
October 28, Mark Erickson, attorney, "Divorce â€“ California Style: Spousal Support"